I respect my yoga mat. Each time I unroll it I’m reminded of the countless times I have stood/lay/balanced upon it as I’ve practiced. As I mentioned to a lovely student of mine, I quite often practice by the window in the sunshine, but it doesn’t really matter whereabouts I am, my mat is with me and that is my little space. 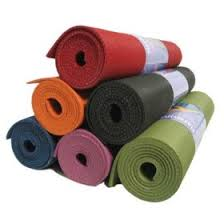 Here are my suggestions for “yoga mat TLC”…. 1. Cleaning – I use a spray-bottle with water, vinegar, a drop of tea-tree essential oil, and a drop of lavender essential oil. The essential oils aren’t ‘essential’ but they are nice. If you just use water & vinegar, don’t worry about the vinegar smell as it will fade. Spray over mat, wipe down, maybe repeat, then allow to dry inside (not in the sun). You may be surprised how dirty the cloth ends up. 2. Keep Out of heat & sun – I have a Jade yoga mat which I love because it is both environmentally friendly and has great grip, however I need to keep it out of the sun. Please don’t leave your mat in a hot car. 3. And finally the best thing to show your mat how much you love it …… roll it out and practice yoga! I promise you your mat won’t mind whether you do a series of challenging postures, rest your forehead down in Child’s pose, or lie in Shavasana. A handy hint is to keep your mat nearby in a room where you are most likely to practice. Sometimes if I decide I would like to literally ‘roll’ out of bed in the morning and onto my mat – then I have it ready and unrolled the night before, right beside my bed, voila! Happy yoga mat, and happy yogi!